TORONTO (Reuters) - Populist Doug Ford's election victory in Ontario on Thursday will send investors searching for an economic blueprint for the right-leaning Progressive Conservative Party, which ended 15 years of Liberal rule in Canada's most populous province. The Conservatives, led by Ford, will win the majority of seats in Ontario provincial legislature, Canadian networks projected on Thursday. 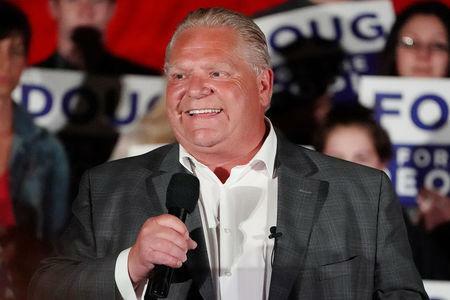 Ford, a businessman with relatively little experience of public office, has promised to cut spending by at least C$6 billion ($4.6 billion) a year by finding efficiencies, but said he would not be able to balance Ontario's budget in his first year in power. Ford has not released a fully costed platform, which could have reassured investors that Ontario's deficit would not worsen and that the supply of bonds would slow. Increased issuance tends to reduce the attractiveness of the bonds and raise the cost of borrowing. "No surprise in Ontario election results. Conservative win positive for business. Canadian dollar is steady so far," said Colin Cieszynski, chief market strategist at SIA Wealth Management. Ontario, Canada's economic engine and the center of its financial and manufacturing activities, has one of the largest sub-sovereign debts in the world, totaling nearly C$350 billion ($272 billion) in March. "If they (the Conservatives) manage to have a plan to bring the budget back into line, it should be good for the province," Hosen Marjaee, senior managing director, Canadian fixed income at Manulife Asset Management, said before the election results. "In the meantime, there might be some wood to chop to bring the budget back into a balanced situation." The Conservatives, who last ruled in 2003, have a history of deficit reduction while cutting spending and taxes. If Ford follows through on a promise to cut Ontario's corporate tax rate to 10.5 percent from 11.5 percent, it could ease investor concern the province is losing competitiveness to the United States. In April, Moody's downgraded Ontario's credit rating outlook to negative from stable. It costs more for the province to borrow in the bond market than some provinces, such as Quebec and British Columbia, which are running balanced budgets. The yield on Ontario's 10-year bond on Thursday was at 2.935 percent, about 66 basis points more than Canada's federal government pays to service its debt of the same maturity. As jarring as the Liberals' projected deficits were for investors, the province's auditor general found in a report in April that the deficits had been underestimated by billions of dollars. Ford has said he would launch an independent inquiry into the previous government's books.